The most advanced breathalyser for personal testing. 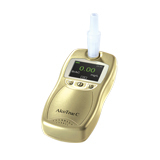 When accuracy and reliability is your primary concern, AlcoTrue C is the breathalyser you can trust! AlcoTrue C is your best partner for personal testing: whether it is for the morning after test or to verify if you are safe to drive.